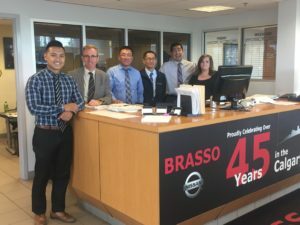 One of the most trusted Nissan service departments not only in Calgary but in all of Canada, Brasso Nissan, didn’t earn the confidence of its customers by accident. A record of reliability and trustworthiness is what sealed the deal. Brasso Nissan has been providing top-notch customer care since 1969. We offer both new and used vehicles, as well as auto parts and auto repair services. In additional to all of that, here are the top five things that the sales staff at Brasso Nissan wants you to know about our dealership. Brasso Nissan’s fantastic reputation rests on over 45 years of doing our utmost to treat our customers like family. As a family-owned business, we strive to make the process of buying a vehicle as straightforward and stress-free as possible. Deposits are completely refundable, and our transparent pricing doesn’t include any fine print. A big part of treating our customers like family is a willingness to listen. At Brasso Nissan, we understand that our role is to listen to your needs, not the other way around. Our sales staff truly have your best interest at heart and are here to guide you along on your search for the right vehicle. After listening to your wants and needs, the sales people at Brasso Nissan will match you up with a vehicle that best suits your lifestyle and your budget. We won’t push you to “over shop” for a vehicle that is out of your price range or a vehicle that is wrong for you simply because we have an oversupply. For the convenience of our customers, Express Service at Brasso Nissan is available by appointment and walk-in. If you have a busy schedule, then making an appointment will secure your spot and have you back on the road in under an hour. If you prefer to swing by for a walk-in, we’ll still provide you with the same great service and have your vehicle worked on as soon as possible. Brasso Nissan has two vans providing door-to-door shuttle service throughout SE and Downtown Calgary. To complete the service experience, we also offer 30 no-charge service loaner vehicles so that you don’t have to sacrifice your schedule while your vehicle is being worked on. Complimentary services aren’t an extra perk that you have to pay for at Brasso Nissan; they are the norm. We offer a complimentary car wash with every full-service appointment, and by request with every Express Service, whenever temperatures are -5 degrees and above. We also provide a complimentary car care clinic to help buyers become acquainted with their new vehicles. When you visit a dealership, either to purchase a vehicle or to have your vehicle serviced, you shouldn’t have to put your guard up. Brasso Nissan seeks to provide every person who comes through our doors with a stress-free environment where they can find the perfect vehicle for their needs and where they can gladly return for all of their auto services. To experience our customer-focused customer service for yourself, just visit Brasso Nissan today.